before the prices of imported goods rose. by consumer research firm Nielsen found. and a steep devaluation of the Russian currency. savings before the prices of imported goods rose. Nielsen’s commercial director for Russia, said in a statement. percent planned to switch to cheaper food brands. 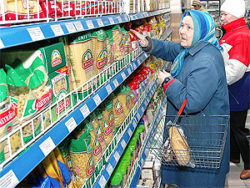 domestic product by up to 5 percent this year. margin of error did not exceed 0.6 percent.